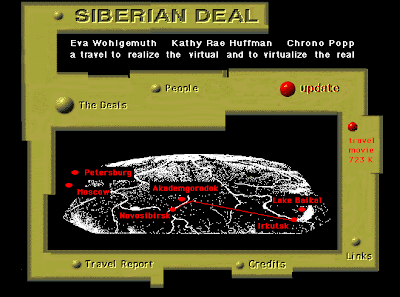 In the "Siberian Deal" website, places are shown in snapshots taken of people and places where they went to buy items for trade with people in Siberia. "My idea was to buy things not for myself, but to trade them in Siberia. Thus it was actually more fun to shop - I was completly free to choose, it was just the appeal of the object, I could follow - I didn`t have to matter about sizes or how things would match with others. 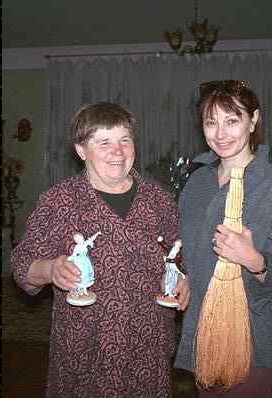 I bought 10 objects in 2 hours - and felt really good after that -" In the snapshot above, the woman on the left is holding two porcelain figurines that she took in trade for her straw broom. They about the person that they traded with and their experiences that they had with the person that they traded with. The way that they represent the different countries, to me, feels more like a log or record taken of their experiences and who they experienced them with. On one page they show a few movies of the item that they bought morphing into the one that they traded for. I believe that the Quicktime movies of the one object morphing into another is very specific to the medium of the Internet. Except for the morphing objects, the website is not all that technically fancy or difficult to make, but the information that they gathered and put on their website is strangely interesting.